Lot 118. 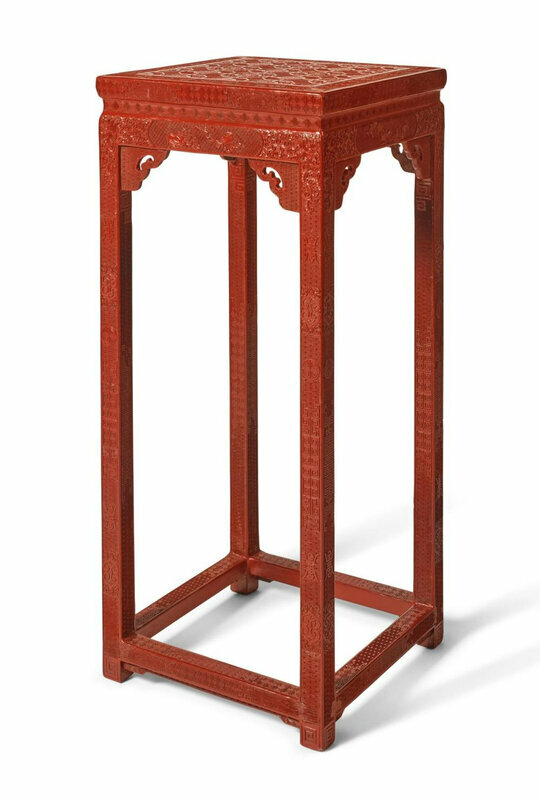 A carved cinnabar lacquer stand, Qing dynasty, Qianlong-Jiaqing period (1736-1820); 95.5 by 41.5 cm, 37 5/8 by 16 3/8 in. Estimate 10,000 — 15,000 GBP. Lot sold 20,000 £ (22,906 €). © Sotheby's. of square form, raised on legs joined by stretchers and set with a shaped apron, the top intricately carved with panels of stylised florets against leiwen and wan diaper grounds and bordered with keyfret around the sides, further decorated across with panels of birds perched on blossoming sprigs of peony and magnolia, with a fourth flying above a scenic waterscape, the legs decorated with lotus scrolls in a dense foliage followed by shou characters and keyfrets, the underside lacquered in black. Note:Elaborately carved lacquer stands of this type were known to have been made to furnish the interiors of palaces in the imperial compound; see two carved cinnabar lacquer stands, together with a throne and screen, illustrated in The Palace Museum Collection. 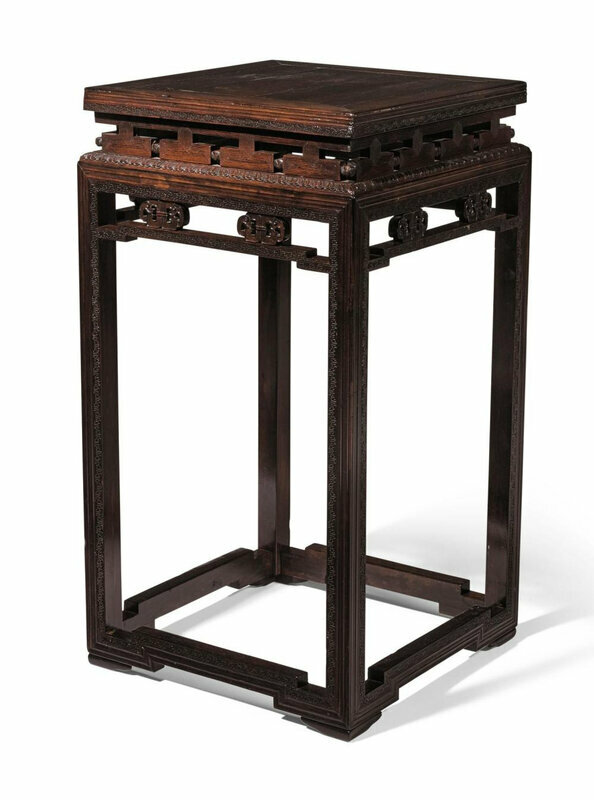 A Treasury of Ming & Qing Dynasty Palace Furniture. Volume 2., Beijing & Chicago, 2007, pl. 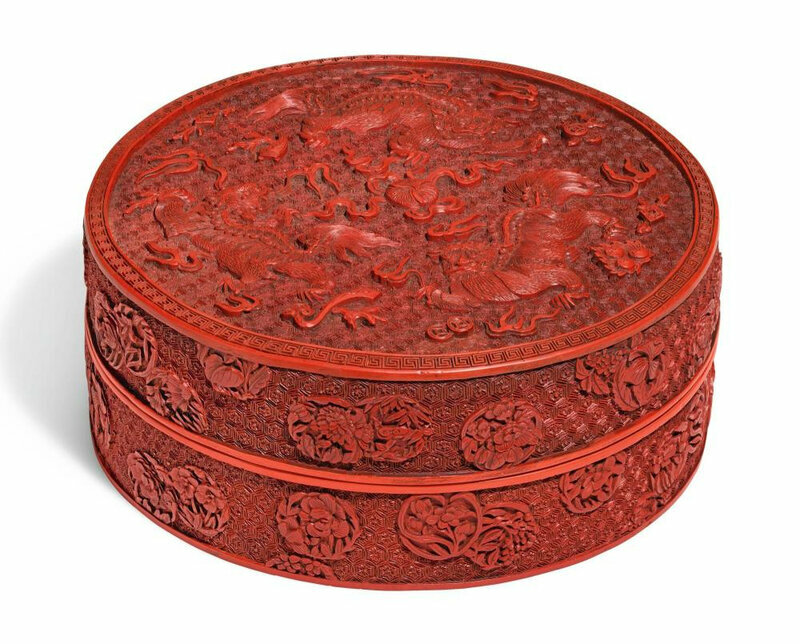 778; and a smaller rectangular lacquer stand carved with a dragon and clouds on the top panel, attributed to the mid-Qing dynasty, originally placed in the Qianqiu Ting (Pavilion of One Thousand Autumns) at the Summer Palace and now preserved in the Palace Museum, Beijing, illustrated in The Complete Collection of Treasures of the Palace Museum. Furniture of the Ming and Qing Dynasties (II), Hong Kong, 2002, pl. 158.